One of the men behind Lost and The Left Overs is turning his attention to the deconstruction of the superhero genre. Rumor is that Damon Lindelof is working on a Watchmen television series for HBO. The move makes sense considering Lindelof's history of heady projects, and that The Watchmen story is perfect for HBO mini-series, in which nothing has to be held back for content of times sake. I am split on my feelings toward this news. Lindelof is the perfect person to handle a Watchmen television series, but I also believe that the extended cuts of Zack Snyder's 2009 Watchmen film is and will be the definitive modern telling of that iconic story for quite sometime. 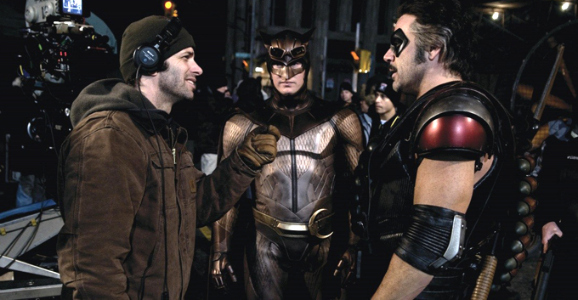 Snyder modernized the story for film in the parts that made the most sense, and was only burdened by cinema time constraints, a problem that was resolved on home video. I realize I will take, and have already taken flack for my love of Snyder's Watchmen, but giant squid in 2009, is that what you really wanted? Come on people!